Rock Farm and Goodnestone Park Gardens, Kent. 13th June. This summer’s endless rain actually stopped and we all had a most pleasurable day. Rock Farm is rather special with many unusual trees, shrubs and hardy perennials. The tulip tree, Liriodendron tulipifera, was in flower, a sight not often seen. There were a number of very striking poppies, including a rich purple Papaver somniferum, and a whole bed of giant Allium heads. The borders were packed with interesting plants and the owner’s enthusiasm was inspiring. The garden was divided into various areas, so as one moved around there was one surprise after the other. The most exquisite bird song accompanied our visit; an especially melodious performance came from a thrush sitting high on one of the surrounding trees. Goodnestone Park Gardens was a completely different kind of garden, more of a parkland with an emphasis on trees. The front of the slightly crumbling house presided over an orderly parterre to meadows beyond the haha. The back of the house overlooked an avenue of trees and beyond to the arboretum. There were a large number of very old trees scattered about, among them 200 year-old sweet chestnut and oak trees, which were wonderful to see. The famous Cornus contraversa ‘Variegata’ was so large that one took a second look to check if it was real. 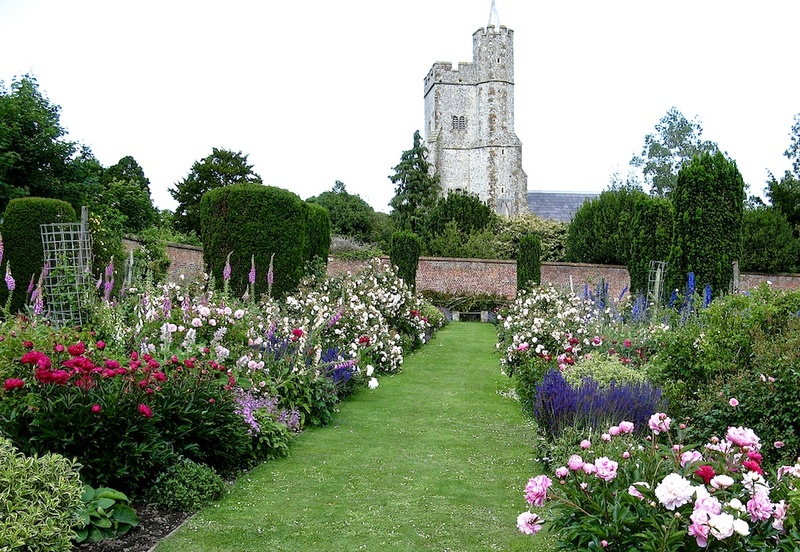 The walled garden was full of roses at their best and gave us a glimpse of the church tower next door, a clever use of borrowed landscape. 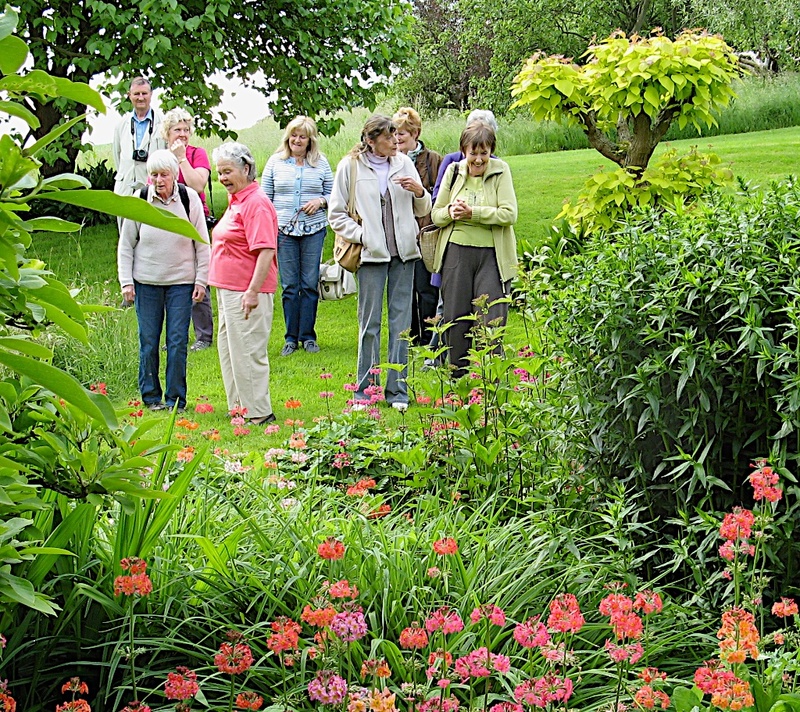 We were lucky that the day remained dry, and we were able to enjoy both gardens to the full. Rich purple Opium Poppies at Rock Farm. 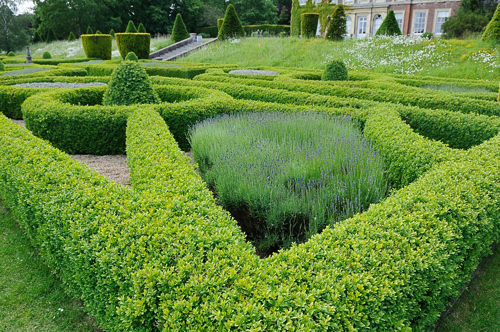 The parterre at Goodnestone Park, designed by Charlotte Molesworth and laid out to celebrate the Millennium. 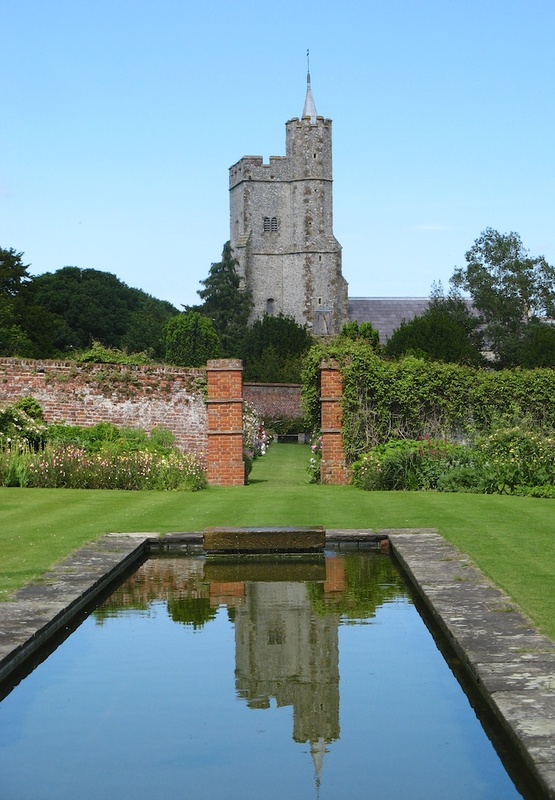 Summer borders in the kitchen garden at Goodnestone Park with a view of the Church tower. The new Rill Garden at Goodnestone Park, completed in July 2009.